Elegant, graceful, our new Bird of Paradise and Lily Arrangement is a statement piece that's sure to be the centre of attention. And as is so often the case, simplicity is the key. Tall Bird of Paradise- perfect in every exacting detail - are complemented by pink Casablanca Lilies. Imposing, imperious, impressive - but most of all stunningly beautiful. 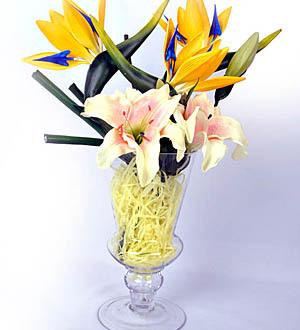 Flower arrangement measures approximately 54cm in height with a diameter of 42cm.